Always seem to be missing inventory? Want the ability to track and trace inventory? Need an easier way to locate inventory? The automotive industry has a variety of parts which depends on the organization of your warehouse in order to arrive at it’s end destination. To organize and manage the countless inventory, we provide an innovative Warehouse Management Software, Wireless Warehouse In A Box™ — This WMS has been integrated with the ability to take your automotive warehouse, 3PL, and distribution business to a completely robust and catalogued level; handing you the ability to track and trace all movements of the parts in and out of the warehouse including the ability to track small important component details like part weight, part group and more. We are driven to ensure that your business is optimized to fully manage and control automotive inventory. 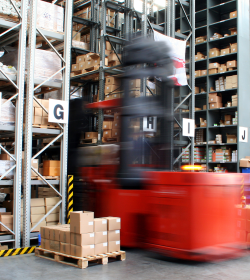 Today, Automotive facilities operating without a WMS typically achieve inventory accuracy of 90% or less, in comparison to 99% accuracy in operations when using a WMS. Increasing shipping accuracy has been proven to lower labor costs, decrease time spent in regeneration of shipping reports, and present consolidation opportunities resulting in time and fuel savings. In addition, a WMS can secure new business through higher service levels and increase customer satisfaction with quicker response times. You and your warehouse operators no longer have to worry about manually entering data or writing down specific inventory details and movements again! Everything is completely powered in our turn-key automotive warehousing system offering you complete mobile control of your warehouse from the palm of your hand.